TV Show King makes us wonder what the difference is between a video game and a regular game. We're aware that they’re judged by different criteria; for instance, no one complains that Monopoly hasn’t updated its look in about fifty years, while the control scheme of Hungry, Hungry Hippos would be lambasted by gamers as mindless button mashing. The only real qualification for making a “game-game” good is the amount of fun you have while playing it. Here at WiiWare World we wouldn’t describe many of our favourite video games as “fun.” They appeal as a challenge or because of their storyline, but they don’t usually make us laugh out loud. TV Show King at least does that. 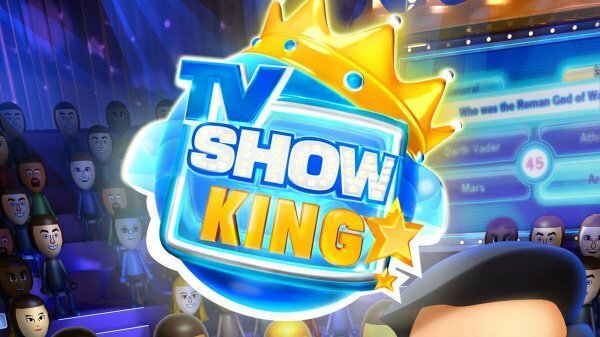 TV Show King is a trivia game which pits you against three other contestants. Presumably, these are your friends as there’s no reason to play the main game mode with one player (unless you’re the guy who cheats at Trivial Pursuit by reading the cards on his own). The questions are divided into loose categories that don’t make much sense. For example, we're not sure why math is considered a “scholarly” subject but not animal science. Maybe all those wild, suntanned animal experts on Discovery are starting to rankle the mathematicians? You use your Wiimote to select your answer. Since you can see everyone’s response, players will often end up chasing the person they think knows the answer. This should detract from the game, but it actually makes for some heated play. The questions aren’t particularly clever, but they serve their purpose, and there are a lot of them set on multiple skill levels. 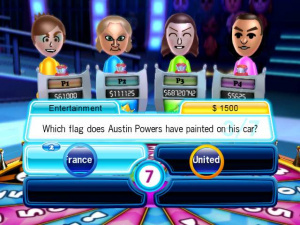 Between rounds, there’s a Wheel of Fortune game that involves using the Wiimote to send the wheel a’turning. You’re basically damned if you do, damned if you don’t, but it’s one of the most fun parts of the game. You can make some completely undeserved bucks or wind up having to donate your earnings to an opponent during this phase. No matter what, the wheel will elicits plenty of whoops, groans, and playful shoving from your friends. Eventually, the two contestants with the lowest scores are bumped off and the top two go head to head for cash and glory. The scoring during this round is pretty goofy. Depending on how poorly you do, you can wind up in last place by the end of it. Now, what kind of motivator is that? TV Show King is a fun game; but as a video game it has issues. Much of the design feels a little amateurish. The opening cinematic is neat: the game uses eye-catching colours and provides a neat view of the “studio” where you’ll be playing. Unfortunately, the rest of the graphics are off. The host’s motions are jerky and his over-the-top Vanna looks blocky. The two seem alien compared to the Miis playing the game. Graphically, the Miis are the best part. They’re animated in the typically over-enthusiastic way that we’re used to seeing. It’s a hoot to catch Mum, Dad, and Spiderman hanging out in the audience (provided you’ve made them). The sound quality is adequate and there is a solid attempt at voice acting, but the host uses very few phrases so you’ll learn them quickly. Trying to give TV Show King a score is tough because it’s more enjoyable than it should be. In fact, it’s almost fun in spite of itself. Most of what you’ll enjoy about TV Show King is what your friends bring from outside the game. You get to shout, laugh, and show off to your pals in an easy 10 minute dose. 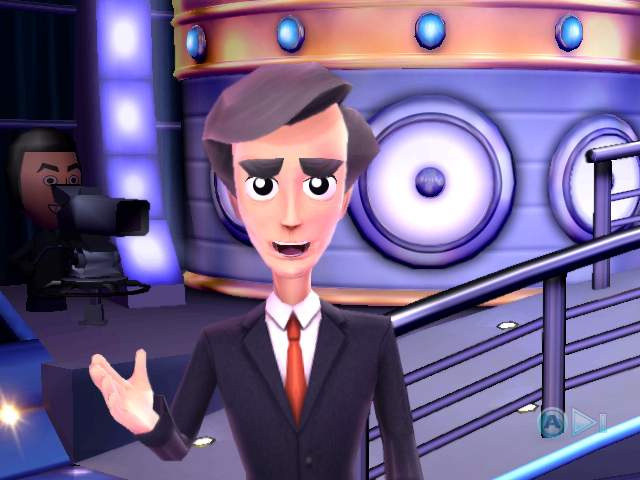 We can't fully recommend it at 1000 Wii points because there’s not much depth to it, but at its core TV Show King is unquestionably good fun. Not sure about this one. Might be fun with some proper company though. And using my Rocky Balboa Mii in a trivia game does sound tempting. Honest, informative review. Thanks Collin! Thank you, V. This is the first time I've done writing like this since high school. I'd appreciate any further criticism or suggestions from you or anyone else who sees this. This game looks like it should be 700 points at most. But maybe if it was 700 points I'd say it should be 500 points. Collin very good review overall and enjoyable to read. I can tell you wrote it honestly and tried to throw a bit of humor into it which worked. I do have a few sugestions though personally as to what I would've liked to have known about. The first suggestion is the controls. I notice in the screen shot that the answers to the multiple choice questions are a bit covered up. How do the controls work in this game? Also you might want to mention that a Wiimote is needed for each person. My second suggestion would be that you mention how often the same question pops up. There is 3,000 questions in the game but the computer could randomly spout out the same question. It happened to me in the NES version of Family Feud. And also to be very techincal say his/her lol. Overall though I really enjoyed reading the review. I liked the way that you introduced the review with talking about classic boardgames to warm the reader up into going the review. And thanks to you I have decided not to purchase this game. I just had a quick game of this with the missus and it was a bit of a laugh. Yes the presentation does leave a little to be desired, but it is a hoot seeing your friend's Miis participating in the game with you. I even saw Mr T and Jackie Chan in the crowd! The questions seemed reasonable, on normal mode I probably got about 80% of them right. You do have to try and be quicker than your opponents in order to earn the most, but sometimes that can lead you to make a rash decision and get the question wrong! The wheel of fortune is a good way of evening out scores if someone is steaming ahead. You can be sure that some idiot will take some money off you if you are the leader just to take you down a peg! On the whole, not bad at all. These sorts of games are not really my cup of tea but my wife DID enjoy it and suggested playing it again, which is rare because she doesn't normally like videogames. It could also be something to do with the fact she won! I bought this game on launch day, knowing full well the style and type of game is not for everyone. So far, I've enjoyed it! I like the quiz show format and spinning the wheel offers some surprising variety as well as a good balance between recovering or losing your cash. I've not yet played multiplayer yet. I wish that this title had online support. 1. The scrolling controls (when viewing the top scores) are poorly designed (holding A and moving the Wii remote results in a poor, jagged onscreen experience.) The Wii Browser use of the B button while moving the remote (or support for the directional buttons on the remote) would have been a better solution. 2. The audio often plays out of sync. When the game ends, the music seems to cut off too soon. 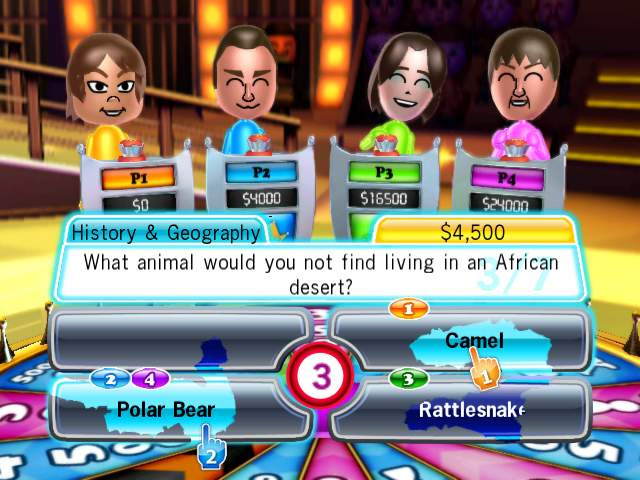 When answering a question quickly, there appears to be a lag for the audio to play out of the Wii remote. I wonder if Wiiware titles can be updated to fix bugs? I also wonder how users are to be informed of these updates? I noticed that the User Guide for the game has a feedback section with the developer's contact info. The fact that you can see what answer the other team are pointing at with their Wii remotes sounds as though it could either be really fun or really annoying. If it's a proper test of general knowledge you're after then it'll likely be the latter, although I can see how it might be fun to "throw the other team off" by feigning to choose a wrong answer. The Mario Kart-esque random factor with the Wheel of Fortune also sounds a bit dodgy for my money. Nevertheless, this sounds like the sort of game that might be fun after a few shandies with your friends! Extremely readable, informative review, Collin, well done. Great review. TV Show King cant help me but think of Smarty Pants. Both are bad in execution one way or another but its nice having this to appeal to said audiences, esp. those who aren't stupid to drop a full price on SP even if they are trivia buffs. I already have Smarty Pants (I got it pretty cheap). Is there anybody who has both who can say which one is better? These are great family games and it would be nice to know which one gets a better reaction. Well I rented Smarty Pants (against my will) and I thought it was horrible. I'm glad you got it for a reasonable price. But to be honest, if you have Smarty Pants, imho, don't bother with TV Show King especially since there are less questions and there are better titles you can buy on WiiWare for the price that it's being offered at. I'm not bashing the title entirely it's just... it has a lot to live up to and there's tough competition for sure. But Smarty Pants can be seen as a pretty good family game. Smarty Pants is neat in the way it tailors question to your age group, not to mention the large extensive question base (but the mini-games are so annoying and they get old so fast I didn't even try them anymore). I do like game shows, but is there any sort of career mode or achievements/unlockables for single player, since I only have one Wii Remote at home and really no one to play it with anyway! Good writing, Collin. Keep up the good work, friend. There better not be too many games like this on WiiWare! Yes Beyondmany they can update the WiiWare title so they can fix the bugs off the program just like nintendo does with the virtual console. I hope that answers your question but if they do that or not is a diffrent thing. @ReaperJ21: It seems like it can be fun, yes, but in short sessions. I'm sure that once you start getting the same questions over and over again, the luster will wear off. It may be worth giving a shot if you're into this genre. But I'd only recommend it (I haven't played it though, just Smarty Pants) if you can play with one other person. Otherwise, the game is near-pointless by yourself, pretty much. It says that it's "unquestionably fun" so it may be worth trying but for 1000 Points, it lacks enough depth to be worth that. If you have a choice, I'd suggest Lostwinds over this, but that's just me. @Boringman: I have a feeling this isn't the end of Trivia titles that are geared to this target market. @sportym/shybrid: It doesn't sound like this game would be for you, then, especially not for 1000 Points. The game is clearly made to be a muliplayer experience and while there may be a single-player component, certainly it is definitely NOT worth 1000 to be playing by yourself. Whats this like compared to Buzz? Me and the missus love the Buzz games, so this peaked our interest. However after reading the review, it sounds like a poor mans version.... true? Well Buzz is a music quiz isn't it so yeah it is more fun that TV Show King I would say. Watching some of those cheesy 90s music clips is great fun. Also who can argue with the voice of Jason Donovan? But still if you want more trivial pursuit style questions then TV Show King isn't bad at all. With 4 players it is still very good fun. Is it only worth it Multiplayer?I may consider it even ifit is overpriced. Multiplayer seems like adequate fun, if not more. I just would say to use your Points elsewhere if you're a lot more single-player. Heh, nice! Glad you're enjoying it. oh boy, i really want to be a TV show king! i could order my TV minions around, like spongebob, and stewi, and how could anyone ever forget hannah montana!!!!!!!!!!!!!!!!!!!!! JK. i know thats not what its really about, but 1000 points is too much money. you could just talk about TV with your friend and it would still have the same effect, except without you having to pay 10 dollars. there are so many better games for wiiware right now, and to anyone reading this, here is the main point... DONT GET THIS GAME( unless you really like game shows, cause if you do, then i am sorry). i played it at my cuz's house and it wasnt fun at all. my cuz liked it for a couple min. but that was it. I was never very good at trivia, I could never remember things when I need to. 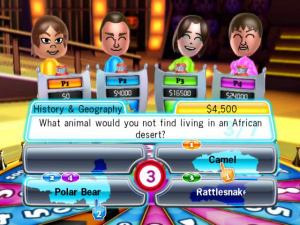 This game looks good for people who like trivia, but then again, according to Mr. y0sh! above, it's not incredibly fun. Fun game when you have partys. My friends and family have a great time in this game and its a pretty good time killer. Its kinda boring if your playing alone so I only recommend this to ppl whos friends or family come over often. I love multiplayer games so I'm considering getting this as I enjoy the Buzz series. It sounds like single player isn't that fun though so I don't think I'll buy it just yet. 1000 Points is a lot to fork out, especially when there are other WiiWare titles that look great too. OKay game for what it is. I like how it uses the miis. It's cool to see you're miis in the audience. But the score is not lying. You'll see the same questions from time to time. Which makes me want to answer a question. If the wii can go online. Then why didn't they make it possible for this game to go on a server to retrieve new questions. I'd give it an 8 considering it is one of the best of its type on the Wii and has Mii support. Does what it says on the tin, and does it well IMHO.